Defend history by fighting off looters who are attempting to steal valuable artifacts from Jamestown archaeological sites. Unless you stop these thieves, history may be lost! So far, archaeologists found weapons, tools and even ear pickers in Jamestown. But who knows what else they will miss if the looters get their way? You must take on the very important task to preserve the culture of the English settlement and learn the story of how they survived and interacted with native Powhatans in their early years. Dig-It! Games is proud to present Loot Pursuit: Early America! 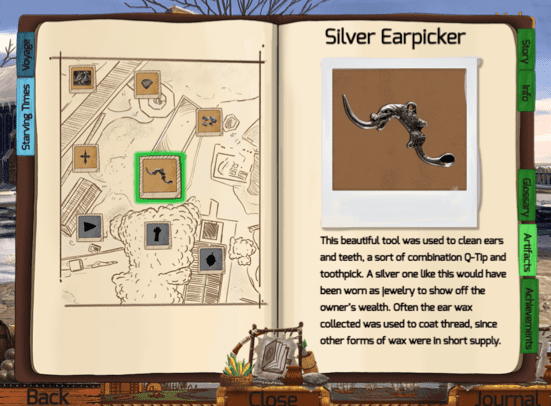 Hone your understanding of Jamestown by saving historical artifacts in this interactive video game! Students who play Loot Pursuit™ Early America can now explore the history of the first English colony in the United States of America with two language options. “We are pleased to announce a Spanish language option with this game,” Says Wilczynski. “Educators now have multiple options to delivery American History not only in Social Studies classes but also Spanish language and English language learning (ELL) programs. We expect that some students may want to play this at home with their Spanish speaking parents expanding cultural awareness across generations. Collaborators/character info: Anna the archeologist leads students through this engaging experience. Anna was created by Michaela Manchego in 2013 during a character creation contest. Loot Pursuit: Early America should be a valuable part of both United States and Virginia State history classes. We have included Common Core and Virginia State Standards that are included in this game. Players can play a practice mode that allows students to focus purely on math skills. Math problems in the practice mode are purely computational and skills for practiced support can be chosen by teacher or student before practicing. During gameplay mode, students can choose from three levels of math play (easy, medium and hard) which correspond to the grade levels addressed in this game (4th, 5th and 6th grades). As the game begins, players are introduced to the challenge of thwarting looters at Jamestown by the archeologist Anna who also gives background knowledge on what happened in Jamestown. 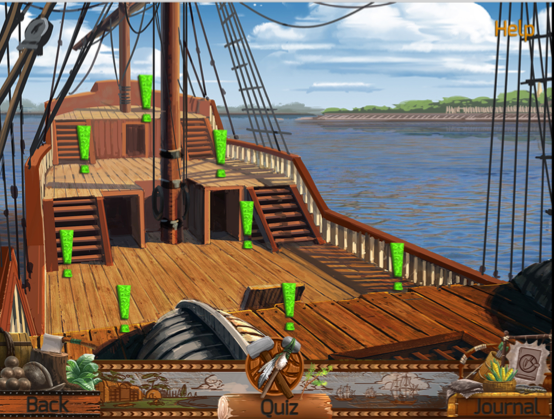 The first level centers on the arrival of settlers and students must collect eight artifacts by solving math word problems that also support the historical content of the level. Once students have mastered the first level and collected all artifacts in their journal they complete a content based quiz to proceed to the next level. The game consists of five levels: The Arrival, Starving Time, Life at Jamestown, Native Interactions and People at Jamestown. Students earn achievements to reward and mark their progress through each level. The game ends once students have recovered all the artifacts and successfully protected them all from the looters. Loot Pursuit: Early America is supported in the classroom by engaging classroom lessons that focus on the skill of artifact analysis and the telling and retelling of the Jamestown story through an interactive card game called Jamestown Noun. There are also ideas on how to best include the video game in a unit of study and on field trips! VS.4: The student will demonstrate knowledge of life in the Virginia colony. solve single-step and multistep addition, subtraction, and multiplication problems with whole numbers. 5.4 The student will create and solve single-step and multistep practical problems involving addition, subtraction, multiplication, and division with and without remainders of whole numbers. 5.5 The student will a) find the sum, difference, product, and quotient of two numbers expressed as decimals through thousandths (divisors with only one nonzero digit); and b) create and solve single-step and multistep practical problems involving decimals. 6.7 The student will solve single-step and multistep practical problems involving addition, subtraction, multiplication, and division of decimals. Determine the meaning of general academic and domain-specific words or phrases in a text relevant to a grade 4 or 5 topic or subject area. 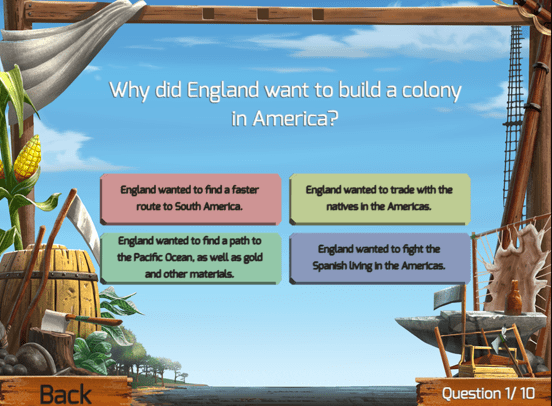 Students will identify and make connections from classroom content on the Jamestown colony to gameplay with Loot Pursuit: Early America. Students will learn key concepts and content associated with the arrival, Starving Time, people and events of Jamestown as well as their interactions with the Powhatans. Students will analyze artifacts and determine how they connect to the life and events of Jamestown. Students will complete math word problems using basic computation whole numbers and decimals. 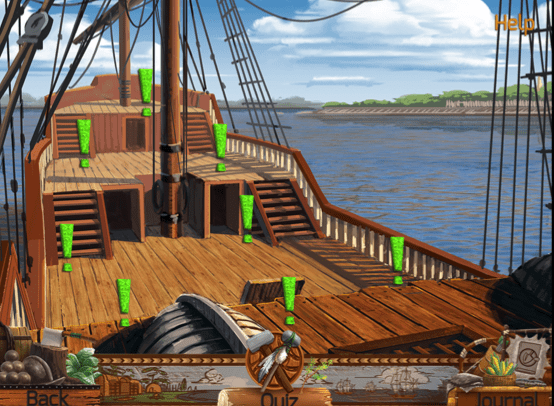 Scope and Sequence: Loot Pursuit: Early America is a great addition to a standard United States History course that explores the earliest English settlements in the New World. See the Blended Learning Lesson to see the content that is covered in the game in order to best plan how to incorporate into your class!